Shandong is located on the lower reaches of the Yellow River, in the eastern section of the North China Plain. The Shandong peninsula borders the Bohai Sea, and has a coastline of approximately 3000km. 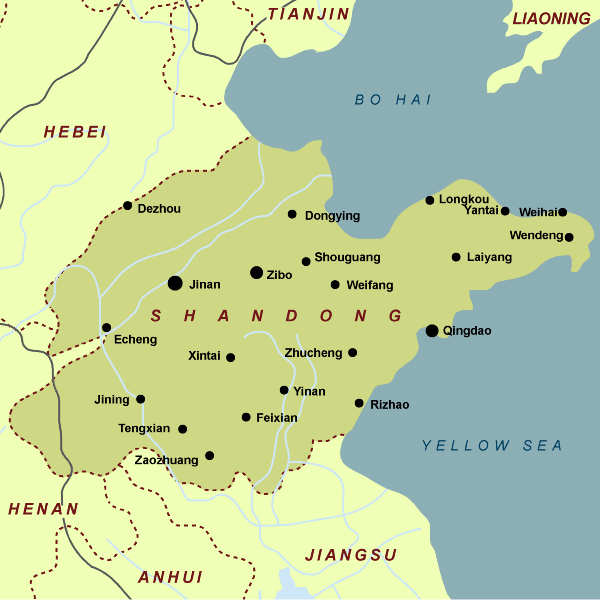 Shandong covers an area of over 157,000km2 and has a population of 9580 million (2013). The main cities in the province include Jinan, Yantai, Heibei, and Zibo. The Shandong province is one of China’s most rapidly developing provinces, and has the 2nd largest population in China. It has the third highest GDP, and is responsible for 1/9th of China’s GDP. In 2013, the Shandong province was listed as the most competitive province along with Guangdong and Jiangsu. The main airports in the Shandong province are: Jinan Yaoqiang International Airport, Qingdao International Airport, Yantai Laishan International Airport, Weihai Dashuibo International Airport, Linyi Airport, Jining Qufu Airport, Weifang Nanyuam Airport, and Punta Lesja Estuary Airport. Qingdao Shandong International Airport and Yantai Penglai International Airport are both international airports currently under construction. Qingdao Shandong International Airport will become Shandong’s regional hub airport, and the largest foreign international airport in the region. The airport will become one of the eight international airport hubs in the country. Jinan, Qingdao, Yantai, and Weihai all currently have international airports. They have routes to Taipei, Korea, Germany, Thailand, America, Japan, Hong Kong, Singapore, and other international routes. The main ports in the Shandong Province are: Yantai, Qingdao, Weihai, Rizhao, Longkou, Dongying, Binzhou, and Weifang. In 2013, the costal port cargo output in Shandong was 1.18 billion tons, an increase of 10.8 percent from the previous years. In 2013, the 4 principle railway stations in the Shandong province were Qingdao station (passenger), Jinan Station (passenger and freight), Jinan West Station (freight marshalling yard), and Jinan West Station (Beijing-Shanghai High-speed passenger rail station). The Green Rongcheng intercity railway is Shandong’s first regional intercity high-speed railway. It connects Yantai, Qingdao, Rongcheng and Wieihai.Jinan North Railway Station, Jinan Railway Station and Jinan West Station are the terminus of routes from Beijing, Shanghai, Qingdao, and Handan as well as from other cities in Shandong province. Jinan West Station serves as the hub for high speed journeys to and from Shanghai. The Shandong province has multiple train routes throughout the country. In Jinan, there are plans to build a six line subway system. As of today, three lines have been confirmed and are under construction. In Qingdao, the subway lines are still under construction. Shandong is an economic powerhouse and one of China’s most dynamic regions with major potential for development. In 2013, Shandong’s GDP amounted to about US $83 billion, and ranked third in the country. One of the key industries in the Shandong province is agriculture. It is the top producer of cotton, edible oil, grain, fruit, aquatic products, vegetables and animal products in China. Shandong accounts for a quarter of China’s total agricultural exports. Other well-developed industries in the province include iron, steel, automobile, petrochemical, shipbuilding, light industry, non-ferrous metals, textiles, electronic information, and equipment manufacturing. Shandong is focusing efforts to boost service industries such as education, information, R&D, logistics, tourism, culture, finance, commercial service, and healthcare. The US is Shandong’s largest trade partner and the fourth largest source of FDI in the country. There are approximately 1186 American-invested companies in the province with over US $8 billion total investment. Such companies include GE, GM, International Paper, Caterpillar, HP, Walmart, Tyson, Microsoft, and Eaton. In the Shandong Province, there are three national economic and technical development zones, five export processing zones and one bonded zone. Set up in 1991, Jinan High-tech Industrial Development Zone was one of the first zones to be approved by the State Council in China. It covers an area of 15.9km2 and is divided into three areas: the central district, the export processing zone and the eastern new district which is managed by the municipal government. The zone is strategically placed just 15 minutes away from the airport. Some of the key industries in the zone involve the food and pharmaceutical industries, the mechanics industry, and the electronics industry which is based in Qilu Software Park and includes enterprises such as Panasonic. The Jinan Economic Development Zone was set up in June 1999 and covers an area of 30km2. From 2001, fixed asset investment reached US $1146 million (7180 million RMB). Main industries in the zone include mechanics, electronics and manufacturing, making up a total of 153 enterprises. Situated in the north east of the city, the Jinan Lingang Economic Development Zone was founded in 1993. It is home to Jinan International Airport.The primary industries here are chemical engineering, electronic communications, auto parts, and mechanics. The Yantai Economic and Technological Development Zone was incorporated in 1984 and is one of the earliest approved state level economic development zones in China. It has approximately 10km2 of developed land and a GDP of around US $16 billion, and utilized FDI of US $410 million. The zone is located less than 10km from Yantai Laishan Airport, the G204 Highway and Yantai Port. Major investors include: Daewoo, GM, Foxconn, Denso, Asahi Kasei, Henkel, LG, Toyota Tsusho, and Hyundai. Industries encouraged within the zone are automobiles, IT, machinery, electronics, textiles, bio-pharmaceuticals, food processing, and chemical fibres. The Yantai Hi-Tech Industry Development Zone is located in the eastern part of Yantai City, and was incorporated in 1998. It is an internationalized science and technology industry park opened to the Asia-Pacific Economic Cooperation(APEC), with four other hi-tech zones in Beijing, Suzhou, Xi’an and Hefei. It has been authorized by Ministry of Science and Technology to set up the only Sino-Russia Hi-Tech Industry Cooperative Example Base of China. In 2010, it upgraded to the national-level Hi-Tech industrial zone with the approval of the State Council. The zone has a total area of 48.8km2 and a resident population of 75,000 (2012). This area is one of the most active and holds huge economic development potential for Yantai. Hi-Tech projects of new materials, biological engineering, chemical production/processing, pharmaceuticals, and telecommunications equipment are encouraged industries in the zone. The Yantai Export Processing Area is located in the northern part of Yantai. Established in 2000, the area has a total area of 2.96km2. The Yantai Export Processing Area has a good transportation network, and is located close to the ferry port, train station, major highways, and only 17km away from Yantai airport. In 2012, the cargo traffic of Yantai Port exceeded 200 million tons. Major investors include Dongyuan Auto Parts, Hurada Chemicals, Hongxing, Beiming Logistics, Kerry EAS, and Sunshine Logistics. The major industries encouraged are automobiles, machinery, bio-pharmaceuticals, machinery, fine chemicals, chemical fibres, new materials, electronics, light industries, and textiles. In the first five months of 2012, the zone’s export and import values exceeded US $1.96 billion, representing a 72.5 percent increase. Zibo High and New Technical Development Zone has a total area of 121.13km2 and was approved by the State Council in 1992. Main Industries in the zone include biotechnology, pharmaceuticals, building/construction, chemical production and processing, electronics assembly and manufacturing, garment and textile production, and telecommunications equipment. Established in 1984, the Qingdao Economic and Technological Development Zone was one of the first 14 national-level economic zones approved by the State Council. It occupies a total area of 20.2km2. The zone has an excellent transportation network and is linked to three expressways. Accessible from downtown Qingdao via the expressway or sea routes, it is about 24km to the city by sea and 66km by the expressway. Trips to the city take approximately 30 minutes via ferry or 12 minutes via speedboat. It is 53km to the airport, an approximately 40 minute drive. The Huangdao Train Station is also located in the zone and connects to the entire national rail network. The station has 26 regular trains, annually transporting a total of 30 million tons. Established in 1992 and located in the eastern part of Qingdao city, the park covers an area of 16.7km2. The park includes the Hi-Tech Product Export Base, Biology Valley, University Science Park, Software Park,HuiteIndustrial Zone, and others. The park is in a central location with Qingdao’s new downtown to the west, Laoshan National Park to the east, and the beach just 12.5km to the south. It is also situated just 12km from Qingdao harbor, 15km from the railway station, and 17km from the airport. High-tech industries and enterprises are concentrated in the northern part of Qingdao Hi-Tech Park. Universities, institutions, research centers and a residential area make up the central part, while the southern part of the park consists of a resort area and tourist attractions. The park is ranked third among the 52 high and new technology zones of this kind in China. Approved by the State Council as a national level development zone on October 21 1992, the zone covers an area of 198km2. US $149 million (400 million RMB) has been invested into infrastructure in the zone. Agriculture also plays an important role in the zone. Every year tens of thousands of tons of grain and thousands of tons of meat are produced in the Weihai Economic and Technological Development Zone. There are also 45 high tech companies with an output value of US $1,962,213,000 (18,390 million RMB). Approved by the State Council on April 27 2000, Weihai Export Processing Zone is situated inside the ETDZ. Its main focus is on exports to South Korea and covers an area of 2.6km2. Various major projects have started in the zone including US $11,400,000 of Korean investment into an electronics company.